If you play a lot of hilly courses, you're already familiar with uneven lies, including those of the downhill variety. This tricky position—in which your leading foot is below your back foot at address—can be very challenging, especially from short fairway grass. To ensure solid contact and a pin-seeking approach shot from a downhill lie, you'll need to make the following three basic setup changes. Your normal iron setup won't work for this lie—the clubhead will bottom out too soon and you'll make contact with the ground behind the ball. Instead, hold your club across your shoulders and tilt your spine toward the target until the shaft matches the slope of the hill. Once your shoulders are parallel to the slope, move on to step 2. It's critical to make ball-first contact from this lie, so play the ball in the middle of your stance (or at least slightly farther back than normal) and shift about 75 percent of your weight to your front, or downhill, foot. This will encourage your body to move in the direction of the slope, rather than hang back. 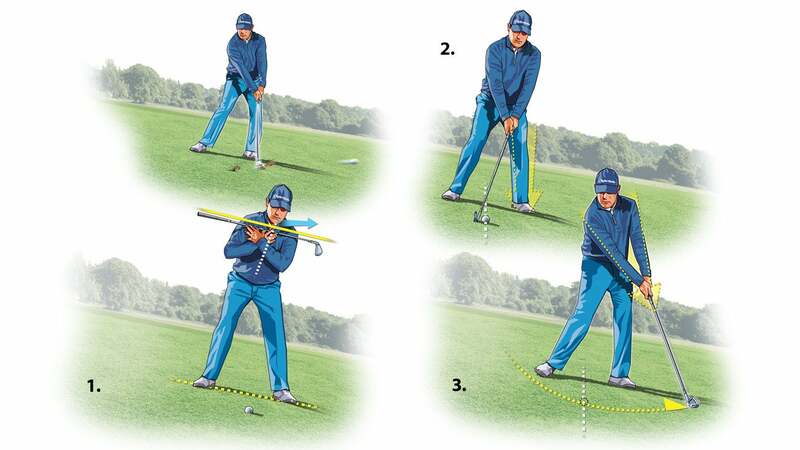 Last, extend your arms through impact so that the clubhead travels as low to the slope as possible. By swinging on the same plane as the hill, you'll ensure ball-first contact and a smooth, full finish— and maybe even a birdie opportunity.